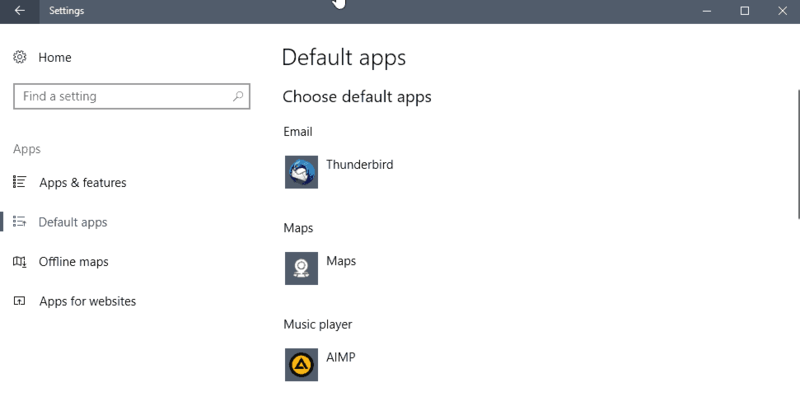 When Windows 10 users want to change default apps on their system, they will likely stumble upon the "default apps" options menu in the operating system's Settings application. There you find a list of core types of applications, email, maps, music player, photo viewer, video player and web browser, and options to map individual apps or programs so that they take over the role on the device. 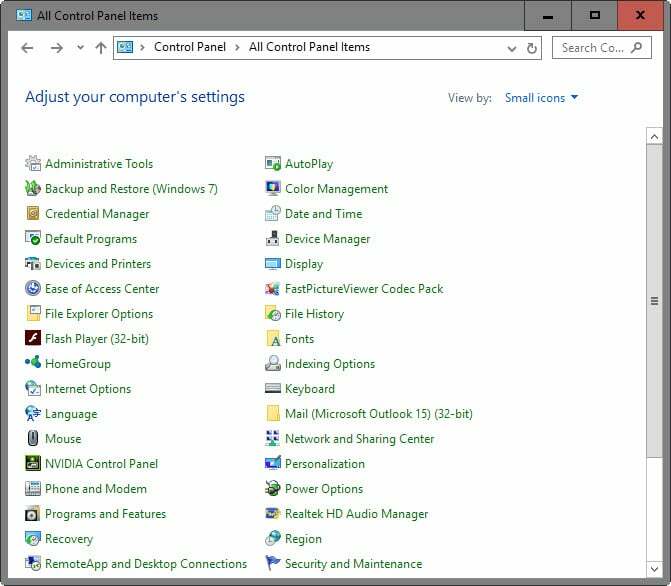 Use the keyboard shortcut Windows-I to open Settings on the Windows 10 PC. Go to Apps > Default Apps. Click on a default application to change it. This opens a selection menu to select another program or use the Store to find an application to use. One issue that Windows 10 users may run into when they try to change default apps is that programs may not be listed in the selection menu. 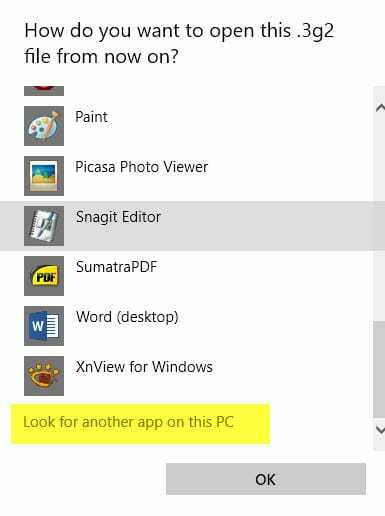 Microsoft displays installed apps and programs in the menu when you click on one of the default apps or programs to change it, and displays a link to find suitable apps in Windows Store. What it does not do, however, is display options to pick a program manually which means that you cannot set portable programs as the default application in Windows 10 using the menu. Any program that is not recognized by Windows as installed or associated with the file type cannot be selected using the Apps menu. While you cannot make portable apps or other programs not listed by Windows the default application using this configuration screen, you can use another way to make the necessary modifications to the operating system. The Settings menu won't help you there, however, as all options that it provides limit the selection to installed programs or apps, and Windows Store. Microsoft wants you to use the Settings application to assign file types to programs. The company removed the option to use the Control Panel to associated file types with programs in Windows 10 version 1803. Problem is: the company did not improve the Settings application in this regard. It still does not feature a "browse" option to pick a program manually from the system. 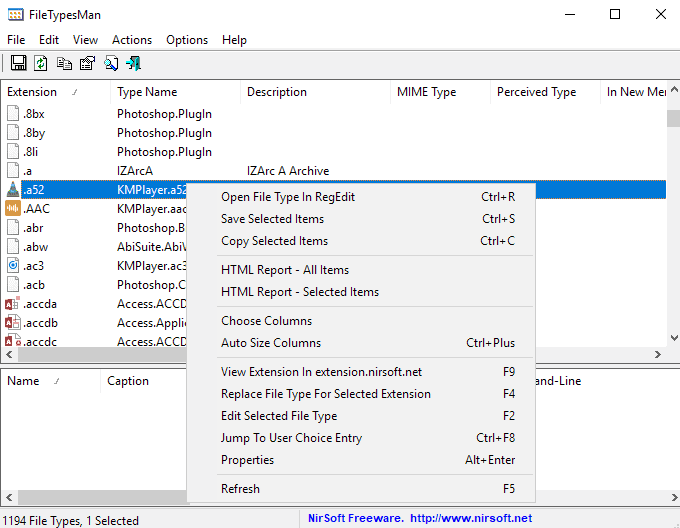 We suggest you use Nirsoft's free FileTypesMan program to regain full control over the functionality. Check out our review of FileTypesMan here for additional information. FileTypesMan lists all known file types in the interface on load and its associations. To change the association simply select it and press F4 to open the change prompt to select a different program. The classic Control Panel, for as long as it is still part of Windows, offers a solution. Update: Microsoft changed the Control Panel options in the Windows 10 Fall Creators Update so that they redirect to the Settings application instead. The Settings application, however, lists installed programs or Windows Store apps only. There is no option to set a program not suggested by Windows as the default handler for a specific protocol or file type. Tap on the Windows-key, type cmd.exe and select the result to open the Command Prompt. 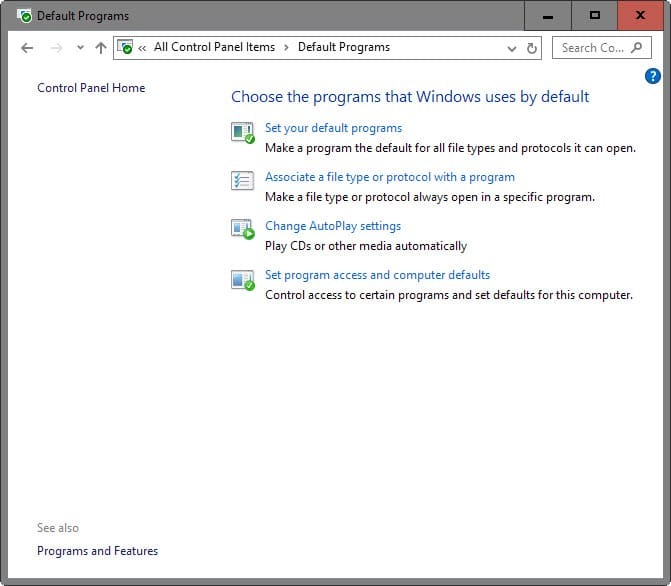 Type control /name Microsoft.DefaultPrograms /page pageDefaultProgram to open the "Set your default programs" Control Panel window. Type control /name Microsoft.DefaultPrograms /page pageFileAssoc to open the "associate a file type or protocol with a program" Control Panel window. Use Windows-Pause to open the Control Panel. If you don't have a Pause-key, tap on Windows, type Control Panel and hit enter. Select "Control Panel Home", and on the next screen "Default Programs". Select "Associate a file type or protocol with a program" on the screen that opens. This loads all known file types and protocols in a long list. Each extension or protocol is listed with its file extension or protocol, a description, and the current program associated with it. There is no easy way to do this, which means that you have to locate all file extensions or protocols that you want to map to a program manually in the listing. This can take quite some time depending on the program. A media player can be associated with dozens of file types for instance. To change the association of an extension or protocol double-click on its line in the listing. Note: If you get "Windows can't open this type of file", select "try an app on this PC" first. Windows displays a selection menu that resembles the one from the Settings application but lists an option at the very bottom to "look for another app on this PC". This option loads a file browser that you use to select the executable file manually on the system. It enables you to select portable programs and programs not listed by Windows in the Settings menu. Note: You may need to click on "more apps" in the menu first, then scroll all the way down until you find the option listed in it. Repeat the procedure for all file extensions and protocols you want to map to the program. Tip: You may also want to try the "set your default programs" option of the Control Panel applet. This makes things easier as it allows you to map all supported file extensions and protocols to a program. Windows may not list portable programs in the menu, however. Windows users who don't run portable apps on their system may never encounter the issue, but those who do will run into issues when they try to map it to file extensions or protocols as Microsoft has not added that option to the Settings application. Is it an oversight, metrics that show that portable application use is insignificant, or one way to promote Windows Store apps? We don't know at this point, but it is something that Microsoft should address before it removes the Control Panel for good. 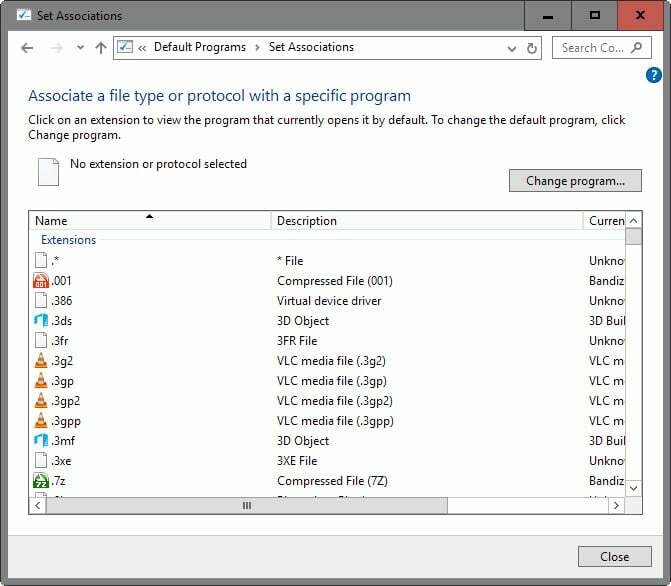 Find out how to make any program on Windows 10 the default application for a specific file type, protocol or purpose. Good info to know and article, Martin. I installed windows 10, 90 day Enterprise Evaluation version back in december. When I started loading test files of all types, one of the very first things I noticed when a default program wasn’t installed was that a usual dialog window would open. But what was so unusual was that the very first choice available at the top of the list was “Get an app from the Store”. So, say you tried to open a .pdf file but had no Adobe Acrobat program installed, the dialog box would 1-st suggest “Get an app from the store”, then it would suggest Acrobat and other vendors. This happened for many filetypes. Talk about an “in-your-face”, pushy approach! Needless to say, I quickly found a way to disable all this “get it from the store” crap and thankfully, it was easy enough to do. This process is so complicated that it is obvious MS has done it deliberately. It will become almost impossible to set up default programs when the Control Panel is removed. MS wants to monetize the Windows Store, so they have made Win 10 free BUT the Store programs will make them a lot of dollars. Combining this with the problems caused by the installation of KB 3135173, KB 3124262 and KB 3124263, it is not going to make the Enterprise version acceptable to any organisation, especially those which use portable apps. Win 10, unfortunately, is still not out of the Beta stage and will not be a stable product for some time. Cue the “Win 10 is wonderful ” brigade. Or you might try it with ASSOC.EXE and FTYPE.EXE. This was the only thing that worked for me. Not sure if it was the 3rd party text editor I was trying to associate (TextPad), or some other windows related issue, but command line was the only way I could get he setting to stick. I almost always use the context menu option “open with” and choose or find in the file picker the executable I need, optionally selecting “always use this app” or just trying it out first if I’m not sure. Agree with Mick. That’s how I’ve always selected portable apps as the default too. Simple, quick, easy. Infuriating is an understatement… I teach MS products for a living, worked with them since Win 98 and Office 98, and since Win 10 and Office 365, I clearly state to my students / clients how, when and where MS is biased, irresponsible, unrespectful, even dangerous… We HAVE a social responsibility to educate as much as we can, IMHO. Exactly and no change in sight! Yet, most paying customers accept such things without protest. We need a centralised lobbyist force to encourage such desired changes! This is a helpful article, thank you. I’m not sure what a portable app is, in this context. The program that drove me to search for a solution to this issue was Microsoft Publisher 2016. I was very surprised to find that a properly installed Microsoft Office program didn’t appear as an option in the apps list of Windows 10. All of this stuff works for me, but what I’d really like to change is the default app for the URL:Tel protocol. for some reason it won’t let me manually select a program and only gives me the choice of skype or chrome. I have tried changing the registry entry for the Tel protocol to the program I want, but as soon as I click a tel: link in chrome it reverts the registry key. Tried to change default web browser. To portable version. You cant do that like this. Win 10 SP 1. Always show you Appstrore option. Nothing else. Always!!! Hello everybody! I found solution. Use Winaero Tweaker app. This should be able to disable the terrible APPSTORE option. :-) YEP. Disables Store lookup but how about adding “look for apps on this computer” to set a default app. What file type associations are required to turn firefox into the default browser? The problem is not limited to installed programs. I use faststone image viewer, installed by it process, and it does not appear. Perhaps a faulty installer. But such things do exist, and there should be way to set the program you want as default. Looks awfully like an underhand method to ‘encourage’ use of microsoft programs. Doesn’t work anymore. There is no “Look for another App on this PC” only “Look for another app in the Store”. It’s not working for me. I make the change to the program I want as default and select it and click ok, but it doesn’t change. I use Adobe Acrobat X Pro and when made a payment online, to be able to print the confirmation, the site forced me to download Adobe Acrobat Reader. Now all my files open as Acrobat Reader, which requires a paid subscription to be able to do what I did with Adobe Acrobat Pro. In the Set Associations that you describe, when I click on the extension and change to the program to Acrobat Pro, it still shows Acrobat Reader as the default. If I go to Set Default Programs, Acrobat Pro doesn’t show as an option. I was having the same issue with Excel 365 for which we did not have a license, and wanted to use Excel 2007. I had to uninstall Excel 365 first, then use “Open with…” by right clicking on one of the .xlsx files then selecting “Always use……..”, and scrolling all the way down the list of apps after asking to see more apps and clicking on “select an app on this computer”. Viruses behave this way! If MS thinks that by getting heavy handed with the OS it is going to change our minds about what we use… they need to consult with a physiologist on why this will definitely backfire on them. This isn’t working for me, nothing is. I am trying to set microsoft reader as the default .TIF viewer. no matter what I do, when the user logs off, it changes back to the windows photo viewer. You might be interested in knowing that this method does not work on Windows 10 Insider Preview build 17046 (which suggests that the next major update of Windows 10 will not be able to be manipulated this way either). As above, in Windows 10 version 1803, , the control panel shortcut now just brings up Settings. Right-click on the file, select “Open With” and click “Choose another app” at the bottom of the right-click menu. Clicking that gives the dialog box with default app selection that ends with “Look for an app in the Store”. Here’s the tricky bit: Click on the white space under the last option. This extends the list! Scroll to the bottom of this list (assuming your app isn’t listed). Click on the white space, under the last option, again! We’ve ended up formatting PCs back to windows 7 (we had plenty of licenses left) for users who needed more than just “Open windows, read Outlook, Use Word and Excel’. They were a bit put off at first, but then they thanked us for giving them a PC they actually had control over and could configure how they wanted for their needs. Crazy, retrograded way…but it works, keeps happy faces and without loss of productivity due to endless meanderings through one’s OS.